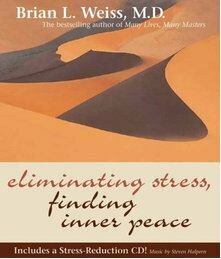 Eliminating Stress, Finding Inner Peace is an important step on the healing journey. Stress kills, there’s no doubt. Stress eats away at our happiness and joy, as well as our stomach lining. Stress raises blood pressure and directly harms our cardiovascular system. Stress depresses our immune system and allows chronic illnesses to overwhelm us, causing pain, disability, and even death. Basically, stress robs us of happiness and joy. Stress is a mental state that can cause severe negative emotional and physical consequences. It can be entirely eliminated, or at least greatly lessened, by adjusting our understanding and attitudes, and by learning simple yet pervasive mental and bodily relaxation. This book and its accompanying stress-reduction CD will help you deeply relax. It will enable you to release the acute and chronic stress we constantly carry in our bodies and our minds. It can help you remove the blocks and obstacles to your inner peace and joy, and prevent and heal stress-related illness and disease. To heal yourself in this manner is a profoundly loving act. It is an act of self-love, because you are taking the time and expending the energy to heal yourself physically and emotionally, and to bring more happiness into your life. Regular practice with the CD will produce deep, long-lasting results.